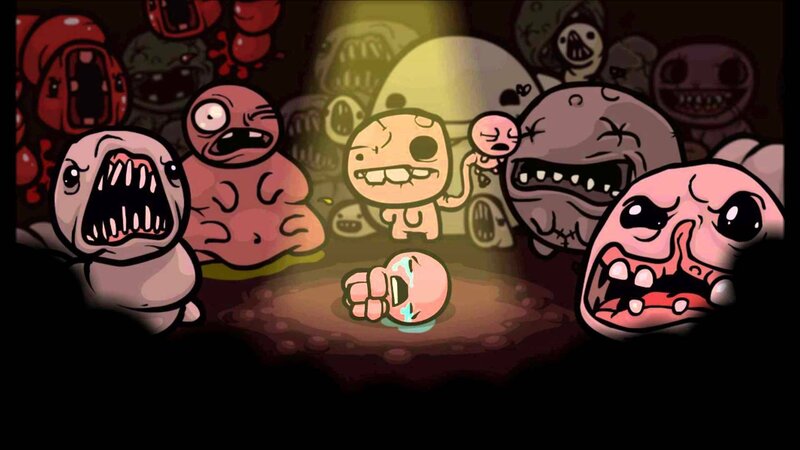 The Binding of Isaac: Rebirth was a slightly surprising announcement for Wii U and New Nintendo 3DS earlier this year, for multiple reasons; it's a game that was previously rejected by Nintendo due to its themes and content, and it'll also likely be the first eShop title exclusive to the New models of the portable family. Some more details have started to emerge courtesy of Nicalis lead Tyrone Rodriguez answering some fan questions on Reddit. For starters, we can expect a release date announcement this month (June) assuming all goes to plan. Beyond that a price of $14.99 in the US is likely, which tallies up with the equivalent cost on PS4 and Vita. Rodriguez was also quizzed on what features will make it across to the Wii U and New 3DS; it was confirmed that cross-save syncing between the two versions won't be possible, for one thing, as it's not integrated at a system level as it is on Sony platforms. It's also been clarified that while the Wii U version will support the local co-op multiplayer option, it's a feature that'll skip the New 3DS - local multiplayer isn't available on the Vita, either. Is this on your wishlist for when it arrives on Wii U and New 3DS? With thanks to Ryan Millar for the heads up. I don't understand why this only works on New 3DS. Videos I've seen don't really show anything that looks too taxing for an original 3DS in terms of RAM or CPU power requirements. Is it down to the control system or something else? I'll probably pick it up for 3DS sometime. I might wait and see if any game-breaking bugs sneak in this time first. Nicalis doesn't have the best track record for QC. @ImDiggerDan It's a twin-stick shooter, so it needs the C-stick of the New 3DS. Monster Hunter 3 Ultimate had an app for save transferring between Wii U and 3DS, so it's not like it's not possible. But whatever, it's not that big a deal. I'm just thankful to be getting this game on a Nintendo system at all. @Jenraux But the ABXY buttons can serve as a poor-man's D-Pad. Not great, but better than not having the game at all. @ImDiggerDan The game requires several buttons to play. the ABXY buttons are most likely used for items, bombs, dropping items etc. Is it cross-buy for Wii U and New 3DS? Already got it on Steam but may buy again in a sale for Wii U, really is a fun game to play for short bursts. @Jenraux Well that makes sense. I knew there must be a reason. @ImDiggerDan It was the only reason I could come up with in my head, like you said, there's no way that it was because of hardware resources. Its not on my wishlist, no. Oh so there will be co-op on the Wii U version? Good, so I definitely am gonna get this. @Sanqet I played it on vita and just don't like it either I thought the graphics are horrible and the game play is not fun as well I don't get all the fuss over mature content I mean what about Angry Video Game Nerd now there is a title you might not want your little one to play LoL ..
Can't wait to play this! I don't have New 3DS nor do I plan to buy one, but I'll definitely get Isaac on my newly bought U. That being said, it'll probably be far from newly bought whenever we do get this in Europe. @May_Nyan But if you use ABXY for firing, what are you going to use for all the other controls? I'm guessing they use the four shoulder buttons on the new 3ds but from what I've seen at least some of those things are also activatable on the touch screen display so it could have worked that way. It could definitely be a reason though, I failed to consider it. Well, it's Niclais, so I expect to see it in Europe in about 2020. Will probably get the Wii U version then. For anyone who is interested in buying this on PC instead, it currently has a 50% off deal on Steam down to £5.49 (or your regional equivalent). Not concerned about the cross save as I don't really want this game on my U with the kids to see it. I'll gladly play it on my 3ds though to see what all the controversy is about. Unless there is some kind of exclusive feature in either of these versions I don't really see a need to buy this again. Good for the folks who haven't got it yet though. Pretty sure I read a blog post/tweet about why they made this decision and it's because they couldn't get the game running at a constant steady frame rate on the original 3DS range. I've owned the PC version of this for a while and it was barely played there, so I don't see me running out to buy this on Wii U. It's the same problem I have had for most of the newer announcements. I would have to be an extreme fan of the game, the gameplay be unique, or have a situation like Trine where my PC only barely runs the game to be convinced to repurchase. So far the only game that has even come close to that was World for Keflings, and even there it is on the bottom of an extremely long list of things I haven't played. I'm definitely getting this one on my Wii U. I have it on Steam, but it's been ages since I've last played it. @Mush123 This guy speaks the truth. "- the game will not be released for the old 3ds, only the new 3ds will run it, we worked on it for over a year and it looked/played horribly. it will only come out for the NEW 3ds system, WiiU and Xbox1." The 3DS version is exclusive to New? That makes it only the second game to be, the first 3rd party game to be, and the first eShop exclusive game to be. Neato! I wonder of other 3rd parties are working on New 3DS exclusive games. Some of the possible item combos are so insane even the PS4 can't handle them without slowing down or even crashing. There's no way the normal 3DS could handle that well without cutting out a lot of more demanding items which would greatly reduce the fun of the game. All that is, while unlikely, legitimately possible within the game. Remember that every tear, enemy, enemy tears, explosion, items, friendly flies and spiders, whatever has to be calculated individually. This is incredibly demanding on the RAM. Even less absurd combos already make the Vita slow down immensely, the normal 3DS would be even worse off.